The free speech social network Gab has been taken offline after being banned by web domain registrar GoDaddy, shopping cart service Shopify, PayPal, payment processor Stripe, web host service Joylent and even blog site Medium since being blamed by the media for the mass shooting in Pittsburgh. 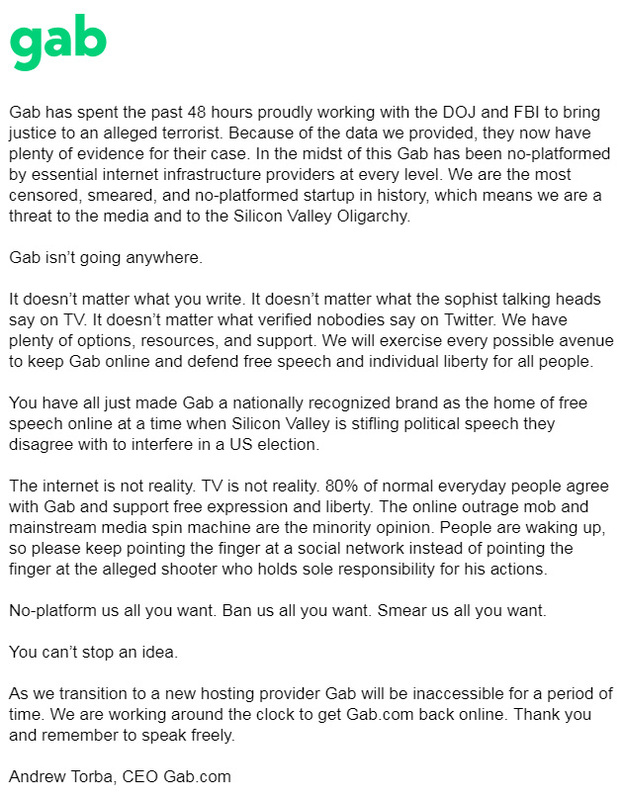 Though heinous crimes are regularly livestreamed by criminal users of Facebook, Twitter and YouTube without the owners of those sites being held personally responsible, Gab is being held to a completely different standard and its founder Andrew Torba is being targeted for personal destruction. That’s exactly what Torba did and yet he’s being blacklisted and banned from every service on the internet over the criminal actions of a user which he had no control over and is doing everything in his power to bring to justice.